Run4Life embraces the concept of circular economy by recovering nutrients and reclaimed water from decentralized wastewater treatment technologies. With the intention of radically changing the outdated “end of pipe” concept, Run4Life aims at developing smart and innovative technologies to improve the recovery of nutrients from domestic wastewater with a decentralized approach. This will be achieved through the segregation of concentrated products as black water (BW), kitchen waste (KW) and grey water (GW). The technological innovations in Run4Life also include: i) low water flushing vacuum system for toilets, ii) separation of BW and KW, iii) hyper-thermophilic anaerobic digestion (HTAD) and iv) nutrient recovery strategies such as bio-electrochemical systems (BES). 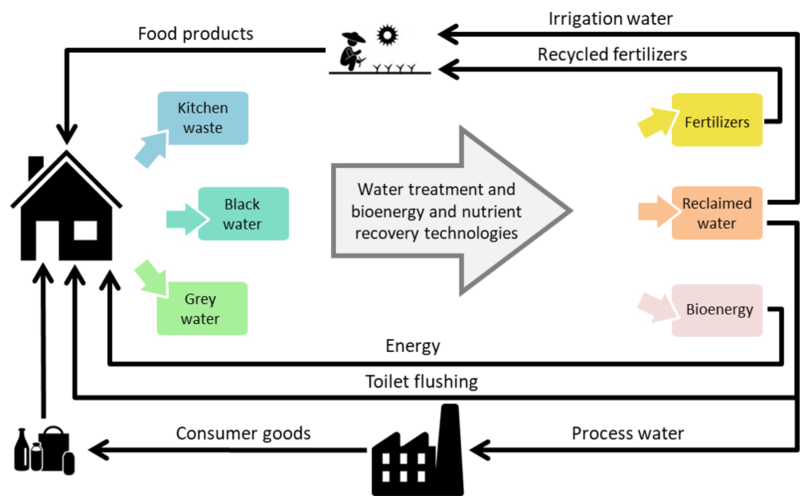 The integration of these technologies in decentralized domestic wastewater treatment plants (WWTP) will allow the potential recovery of 100% of nutrients (NPK) as hygienically safe fertilizers and, at the same time, achieve more than 90% of water reuse within an integral recycling concept aligned with the circular economy.